Roughly every four weeks, or about every twenty-eight days, a full moon rises, which normally means there are twelve full moons a year. But last month, there was a full moon on December 2—and another last night, on December 31. The second full moon in the same month is conventionally referred to as a “blue moon,” the source of the expression, “Once in a blue moon.” Since a blue moon occurs only every two to three years, there are therefore only forty or so blue moons in any given century. It also means that the year that features a blue moon has thirteen moons, as did 2009, for instance. Has the association of the number thirteen with the blue moon led to the popular superstition that a blue moon is a sign of bad luck, or at least some sort of misfortune? Shine on the one that’s gone and proved untrue. But when Elvis got hold of the song, he read it aberrantly, no longer as a ballad. 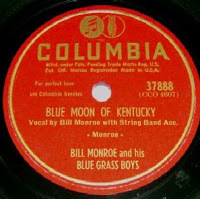 He transformed “Blue Moon of Kentucky” into a song, not of loss, but of love regained. In the process, he also invented rockabilly, which, as Michael Jarrett observes, “was to country music as bebop was to swing.” For rockabilly “signaled a paradigm shift: not harmony and melody, but rhythm and sound—echo from a twangy guitar, slapped bass, pounding piano, or a dixie-fried voice—became the raison d'être of popular music” (Sound Tracks, p. 162).